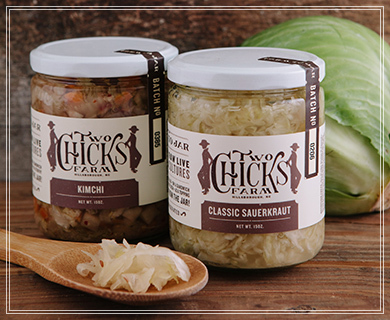 Here at Two Chicks, we use sustainable farming methods & time-tested methods of food preservation – fermenting with salt, pickling with vinegar and preserving with sugar. We’re following in the footsteps of farmers before us to preserve the harvest for another day. We hope you enjoy the krauts of our labor. Cabbage has been harvested for winter and we are busy making our favorite sauerkraut.